I am on a roll now. 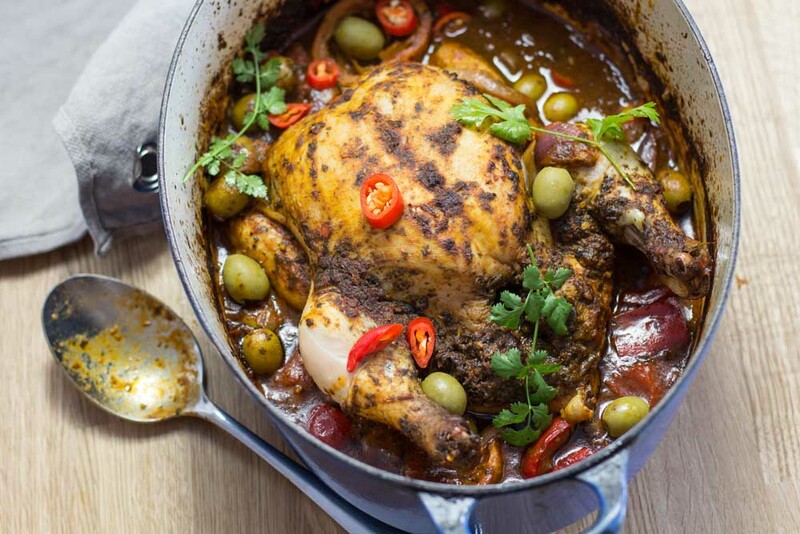 There are so many ways you can cook a whole chicken in one simple pot. I’ve even decided that the whole concept is Pot to Table. Ha, I know its a scream but if you can say Farm to Table then I can say Pot to Table. And that is precisely what it is. Have you seen my previous attempts at this?. There’s Oven Baked Mexican Chicken, there is Oven Baked Coconut Chicken and then there’s the other spin off One Pot Tray baked Satay Chicken or the One Pot Chicken and Noodles or even African Chicken with Peanuts and Sweet Potato. There are loads of them. They are all good and all one pot cooking. Make them your own. The beautiful thing is that they can be done on a BBQ too. It has to be one of those BBQ’s with a lid so you get the oven effect. That means it doesn’t matter what the weather is at your place this chicken is all weather perfect. It lasts me a few days if I am here by myself. But if you happen to have a few people hanging around looking for food (and who doesn’t) then these one pot dishes are for you. Pot to Table for hands off cooking. Secret sneak peak as seen on Instagram. Honey Lemon One Pot Chicken. All chicken cooked like this is juicy and succulent ( I love that word). Watch the video(s). It’s so easy. 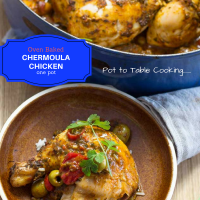 Easy all in one pot roasted chicken. All you need is a salad or simply pour boiling water over some couscous add salt, pepper and olive oil and you have the perfect meal. Heat the deep baking dish on top of the stove (or BBQ). Add the extra olive oil and then saute the onion and capsicum till just softening. Add the olives, the tomato and the stock and stir. Cover the chicken with foil for the first 30 minutes. Uncover and remove the lemons. Continue cooking for another 20 minutes or until the juices run clear at the leg. 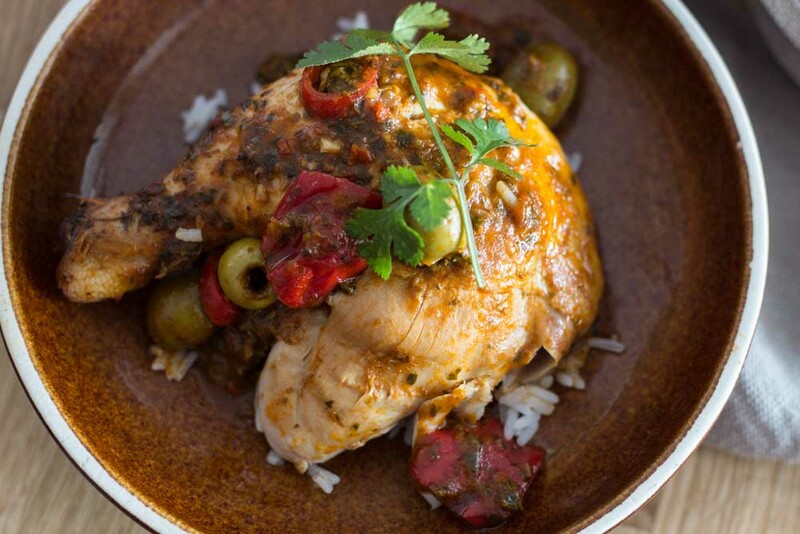 Serve with salad or with couscous or rice. +You can add Preserved Lemons if you like. +Use black or green olives, pitted or unpitted. Yum this looks deliciously juicy and packed with flavour. 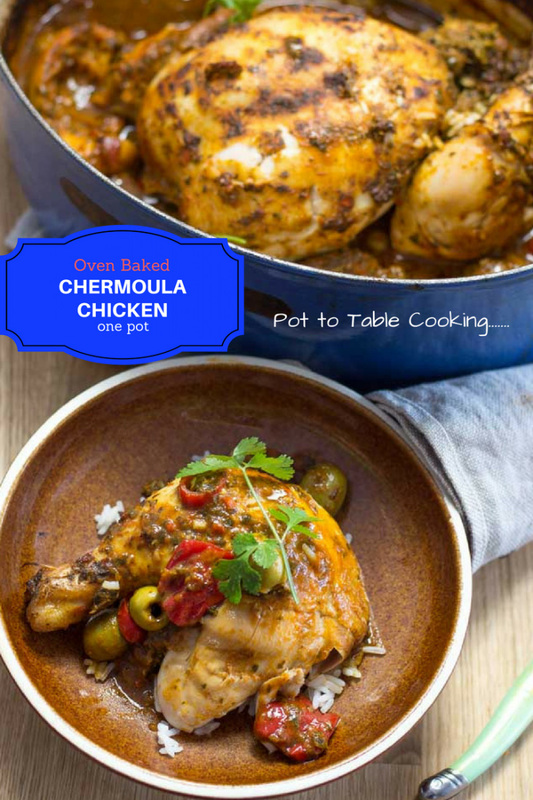 That bird looks so juicy and delicious with chermoula! Step 5 – remove lemons. What lemons? Am I missing something? The lemon rind from the squeezed lemons are added to the chicken in step 4. They are just to add some extra flavour and are removed in step 5. I have reworded it from lemon peel to squeezed lemon halves so the instruction will be more prominent. Hi Charlie. Thanks for your messages and I hope you had a nice dinner! It’s looking very yummy and colourful, I usually like to prepare , thanks for sharing !!! 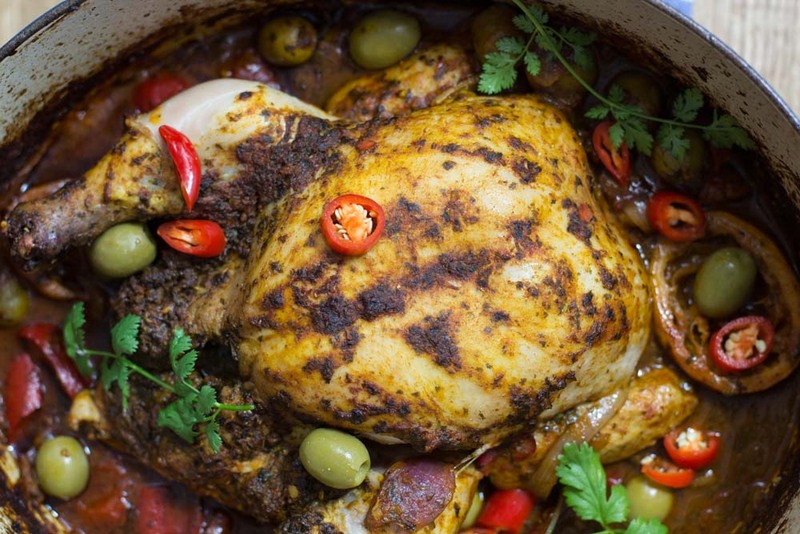 This is such an easy and wonderful way to cook chicken! There are loads of variations which are all delicious, it have become a favorite at our house.